Okay! Musume Time: Let's Keep Going, Even with these Blisters! 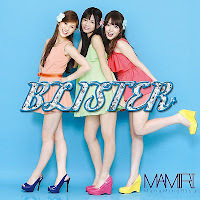 - ManaMinoRisa's 'Blister' PV Review! Let's Keep Going, Even with these Blisters! 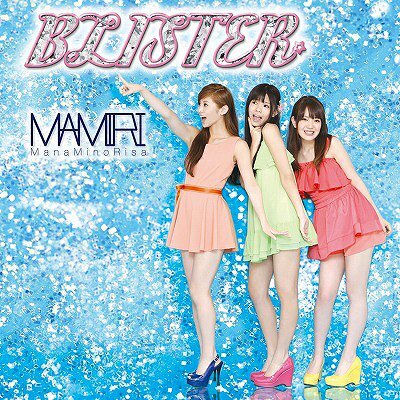 - ManaMinoRisa's 'Blister' PV Review! All opinions = My own! Opinions make this world roll... er, spin? Whatever, opinions are what define a person, and if you don't agree with me, fine, but remember: Respect someone's opinion in order to have yours respected. If you expect anyone to take crap from you because you think your own opinion is divine above theirs, then quite frankly dear, you should expect crap back. Not everyone will want to agree with you, and I certainly don't expect anyone to like my opinion if they don't want to! 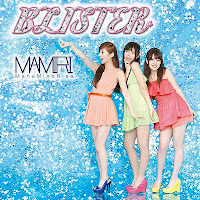 Actually, they are rather good memories, but that doesn't take away from the fact that the title Blister isn't exactly the most enticing name for a major debut single, especially if you have a foot or blister phobia, though let's just say the song is a lot nicer than the title it has, as well as the PV we are shown. Luckily, ManaMinoRisa don't seem to take on that weird aspect like BiS do, so we're saved from seeing actual blisters in the video. Oh lord, if BiS do that, I might just cry, because it would be gross and freaky. Freaky cos' I predicted it, and gross cos, y'know... blisters? Anyway... Taking this topic away from Blisters (well, we can't really, cos that's the songs name), I recently found this through my sister, who asked me if I had seen ManaMinoRisa's latest PV yet, because I had a fling with them and their song Polaris a while back and I quite liked the sound of it. 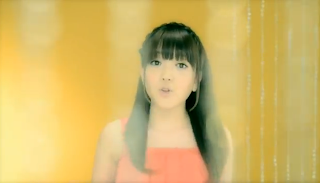 I hadn't seen this PV, obviously, so I went to search for it and it popped up on Page 1 of Google, linking me to youtube. Thank goodness. So, now that I have all of that out of my system, I'm gonna say let's get into this review, right? Because really, I can't just talk all the time about how cute this group is and how much I currently like them. Well, I can... but I have a review to do, so let's leave that till a later date/never, okay? OKAY! So, review time? Are you still waiting for that? You are? Oh, good, because it's time to start! Let's Go and get some Blisters! YEAH!!! 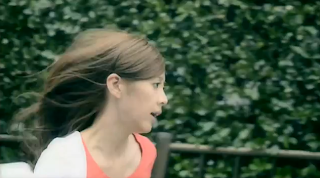 Risa is surprised by the sudden appearance of: THE WOTA! Oh yeah, ManaMinoRisa, so freakin' TOUGH! Look at dem muscles! Look at em bulge! No Blister will beat this amount of strength! Grrrrr! ... At least I think you're Mana? 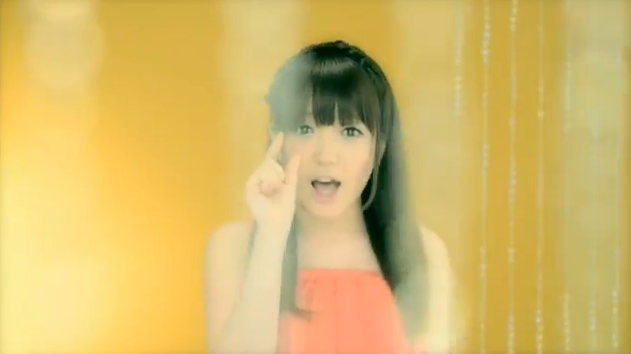 Risa: "He was, like, thiiiiiiiiiiiiiiiiiiiiiiiiiiiiiiiiiiiiiiiiiiiiiiiis small you guys, like Oh Ma gaaaaaaaaaaaaaaaaaaaaaaaaaaaaaaard!" Mana gets bored easily, it seems. 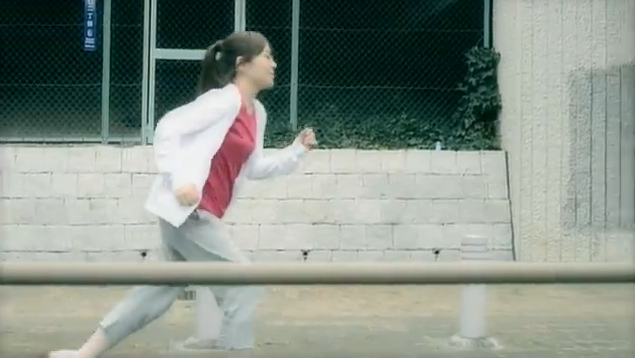 Keep running, Mana, keep running til' you get yourself some blisters!!! Okay, so you're just passing each other? Is this a race or something, or you just gonna ignore each other? Okay, I like this. Simple edit, but very much loved, and also: COLOUR!!!!! Mino: "Ah, are you here to help me up? Thank you..."
Mana: "Er... yeah, yeah... we are... now, where's your wallet?" Mino: "M-My wallet... why do you want to know where my wallet is...?" Risa: "Mana, don't worry, I found it!" Mino: "Eh...? Wait, what...? Someone... help! HELP! THEY TOOK MY WALLET, HEEEEEEEEELP!" Moral of the story: DON'T GET A DAMN BLISTER! I call this The Troll. ManaMinoRisa: "BLISTERS FOR YOU! BLISTERS ON YOU! BLISTERS! 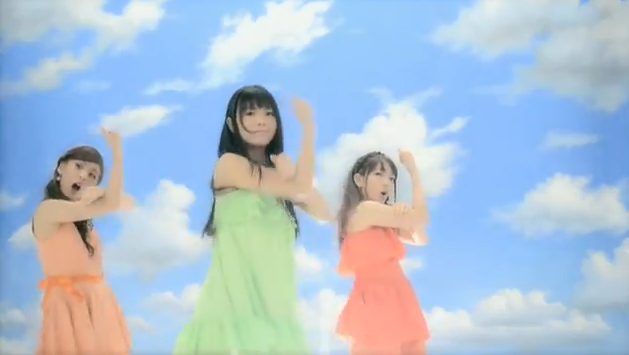 IT'S A DREAM COME TRUE~"
Y'know, this song could totes be an advertisement for Blister cream or something. Look at that pose. It screams positive advertisement. They finally found the real sky... well done, girls! 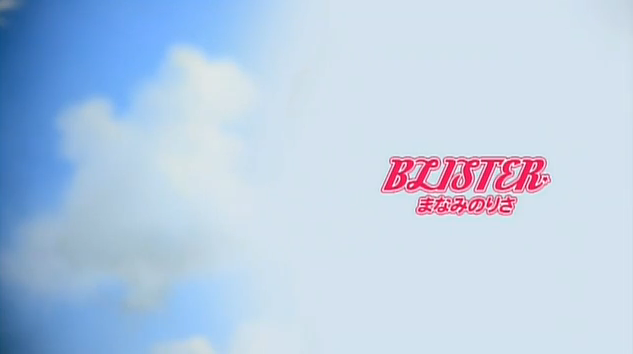 Anyway, Blister is a very nice song, with a very nice PV added to it. Both are quite well paced and fit together well, and the song itself seems quite motivational in its own way. I will also add that the video can be quite motivational as well, what with the running and then continuing even after you have fallen. The PV is pretty simple, and follows every Idol concept you need to make a semi-decent PV, or an extremely enjoyable one. We have the regulation dance shot, the solo shots, and then your miscellaneous shot, which just so happens to be outside. Let's start with the dance shot, shall we? I really am digging this dance. There's a lot of movement here, and these girls seem to be really enjoying themselves. 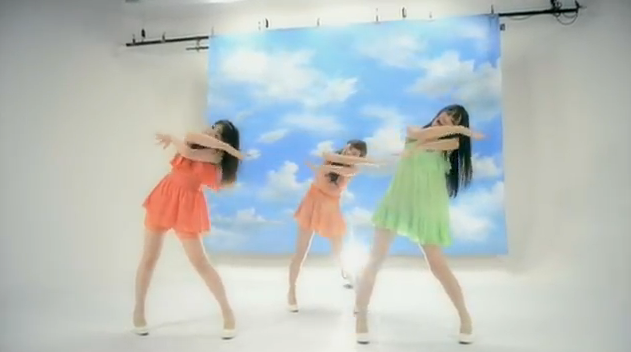 I love the quirky dance moves, some weirder than others, and how happy the girls are. I also love the break towards the end where each girl gets to do her own thing before returning to the dance, though they play around a lot more in those scenes and seem to be more carefree, though the dance itself was already quite fun and carefree to begin with. The dance gets me pretty excited, and I loved watching how the girls moved. These girls are good dancers, and whilst this may be your standard dance shot, seeing the girls have fun and love what they do just makes it so much better and worth the watch. The way they move makes you realise how much they love this, too. Especially Mino. She's crazy into that dance, and I just love watching her! 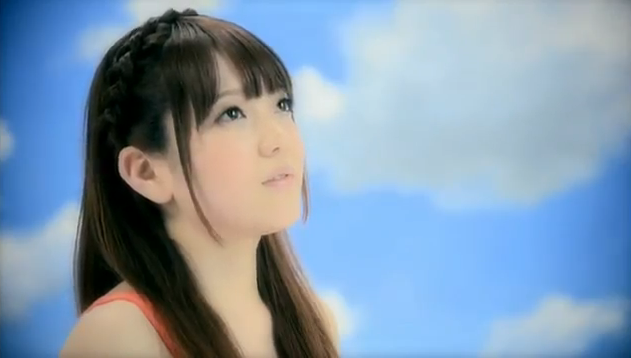 The close up shots are also nice to watch in this. The girls are all really cute, and their smiles are pretty infectious, too. Especially Risa's. Risa has such a gorgeous smile! Also, I like that the girls were given different coloured backgrounds to distinguish them in a way, though they all have beaded curtains in the background, but the change of colour gives us something different and a bit more variety, I guess. I'm also enjoying the out of focus curtains in the shots, too! For both the dance and studio scenes, I actually found the backgrounds quite nice. 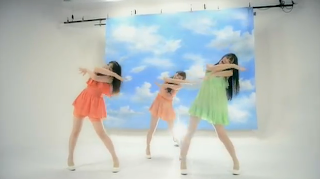 I really liked the clouded back drop that the girls had for their dance scene, though admittedly the light on the floor was really annoying at certain points and I kept getting distracted from their dance, but the backdrop made up of clouds was really cute! 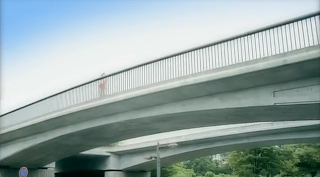 I was instantly reminded of Yappa Seishun by Kitahara Sayaka. And then I saw the clouds move! 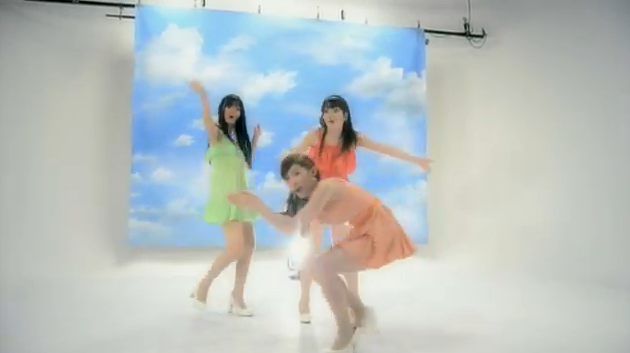 That's when I realised it was a nicely done green screen! Cuuuute! Anyway, back to the PV... the last scenes that we see are the running scenes, which actually ties in really well with the title of this song, I guess. 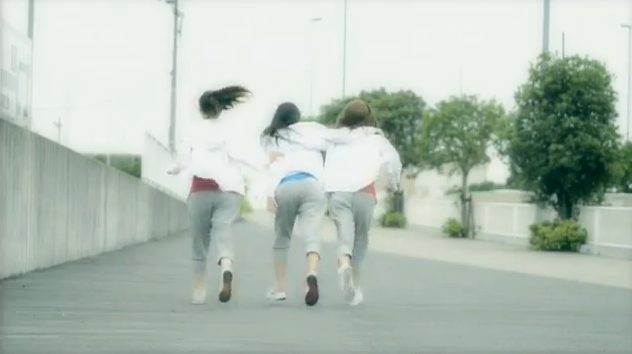 We get to see the girls running, all in different directions, before Mino falls. The other two encourage her get up, and they help her to finish her run. These scenes for me are pretty motivational, as if the video is encouraging the viewers to never give up, even if they fall down, or if they get a blister, but to continue going on until you reach your goal, because nothing can stop you or get in your way unless you let it get in your way. For me, the scenes are encouraging, and motivate me as a person to continue doing things I want to do and to not give up. I think it's cute, and I like how I read a motivational message behind the video. I'm also happy to see such a message in this PV, because it's as if the video is speaking for Mana, Mino and Risa themselves as well as the girls as a group. 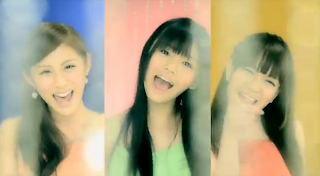 This is their major debut single, and they have been together for, what, four or five years? The video itself is showing that despite their falls and the blisters they gained, they were able to continue until they finally had their major debut and broke out of their Indie days, and that even now they are still going. Their blisters resulted in their dream debut, and they have finally gained the result they had been waiting for and made it to their goal. Well... that's what I think, and honestly, I do think that this video and the song represent the journey and the hardships the girls have had since debuting as Indies Idols. They've been known as Indies Idols for a long time now, and finally they have debuted. I don't think that they could have had a better song or video to debut with, honestly, and the title itself seems to be quite fitting the more I think about it. I like this song and the video, they fit perfectly together, and the message I have read from it is a strong one. 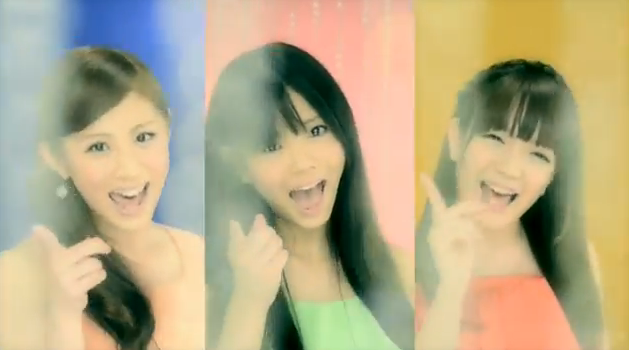 I'm so happy that these girls have debuted!